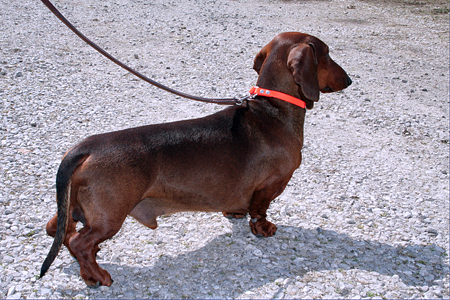 I snapped this photo of DC Lorindol Braveheart SS at the Dachshund Club of St. Louis field trial on March 15, 2008. Bred, owned, and nearly always handled by Vicki & Bill Spencer of Kentucky, "Stoney" earned his FC and DC titles on that day, pinch-handled by Laura Knoll. 13 months later in April, 2009, at 2 years 10 months of age, this dog who had finished his CH from the puppy classes, earned a specialty BV, placed in the Hound Group, and won a field trial class of Field Champion Dogs, was at an earthdog test when he suddenly, so very tragically, died after ingesting poison found on the grounds. The hearts of field trialers nation-wide have gone out to Vicki and Bill. I post this photo as a salute and tribute to these two good dachshund people and their beloved Stoney.